If fast is fun then this should be a fun boat to sail. She is light and narrow enough to show a really good turn of speed and has been very well cared for by her past and current owners. 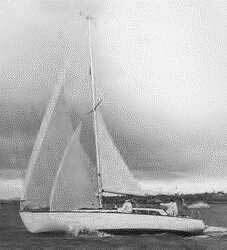 Under her full battened main and jib she is easy to handle short handed and she should provide many more pleasurable hours to her next owner. 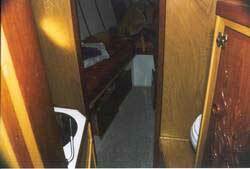 Aft of the chain locker is the v-berth with a large filler piece that makes a very comfortable double. 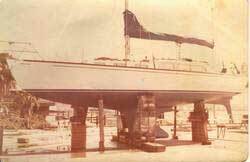 Overhead is a large deck hatch. 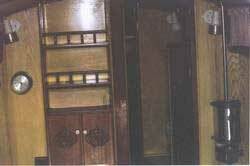 Next aft is the head and hanging locker with beautiful carving on the door. The engine is under a sound deadening cover in the head. 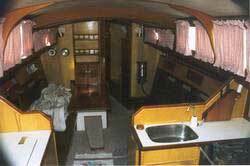 Next aft is the main cabin with settees port and starboard and inlaid drop-leaf table between. The settees are full length and are capable of sleeping two adults. 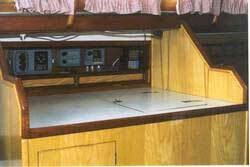 Next aft is the galley at the foot of the companionway. 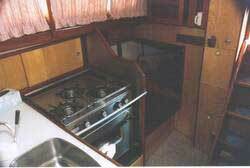 The three-burner propane stove with oven and the stainless steel sink are to starboard and the icebox/chart table and navigation instruments are to port. Under the cockpit there are quarter berths both port and starboard. The large cockpit is comfortable and well protected with deep lockers on each side. The galley and head are equipped with manual cold water pumps. There is good 12VDC lighting throughout and there are gimballed kerosene lamps available should you choose to use them. 'Kiwi Flyer' is cold molded with two layers of kauri bedded in epoxy on both transverse and longitudial framing. Decks and house are marine ply glassed over. The fastenings are silicon bronze. If 'fast is fun' this should be a very FUN boat to sail. She is light enough and narrow enough to perform very well even in light airs. The New Zealanders are famous for their fast, comfortable boats. The careful selection of hardwoods give the interior a warm, but clean appearance. This is a very nice boat!